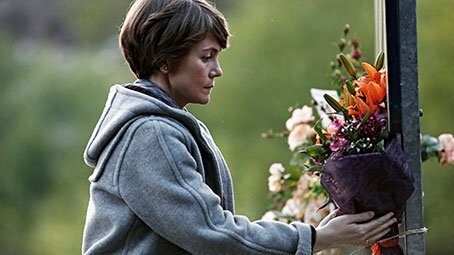 Ane (Nagore Aranburu) lives a quiet unfulfilled life, trapped in a seemingly loveless marriage, until she suddenly starts to receive bouquets of flowers anonymously, once a week. Meanwhile, Tere (Itziar Aizpuru) wants nothing more than a grandchild, but her only son Beñat (Josean Bengoetxea) and his wife Lourdes (Itziar Ituño) have other plans. A sudden, tragic event jolts all of their lives into a new reality, and flowers start to appear anonymously once again, but this time, instead of passion, they represent an emotional memory. With a deep compassion for their characters, directors Jose Mari Goenaga and Jon Garaño examine the unexpected reverberations of a simple yet charged gesture while reflecting on loss, memory, and missed connections. FLOWERS won the Cine Latino Award at Palm Springs International Film Festival, was an official selection at San Sebastian Film Festival and is Spain’s submission to the Foreign Language Film category at the 88th Academy Awards. "A meditation on romance and remembrance." "Enthralling...a symphonic exploration of love and loss." "An elegantly lensed, heartwarming story."